If you are considering the purchase of Carpet Bonded Foam for your floor, there is some basic information you need to know to make sense of the terminology you will find. We are defining Carpet Bonded Foam as a carpet and foam combination. This product can have quite a variety of uses. They are the product of choice for Cheer and Gymnastics. They are now becoming the product of choice in aerobic and martial arts due to their superior footing. The standard competition cheer floor is usually 42' x 54' (9 rolls). The standard competition gymnastics floor is 42' x 42' (7 rolls). There are two main product groups which offer a carpet & foam combination -- Carpet Bonded Foam and Flexi-Rolls®. Each of these are available in a variety of foam thicknesses, colors and types. The bond between the carpet and foam is critical. Floors should not be glued, this is an unsatisfactory method of bonding. During manufacturing of the products described below, the foam liquefies and in the cooling process, the carpet and foam substrates actually become one piece, creating a permanent, virtually indestructible bond. Benefits of heat bonding over loose carpet and foam are considerable. Carpet wrinkling, twisting and shifting are eliminated while durability is greatly increased. Wear and tear on foam is greatly reduced. Bonding makes foam stronger, it dissipates landing impact and produces a much faster responding floor. These products do not shrink or harden over time. This is a carpet laminated to trocellen foam making the top 2 layers one piece (see images). It is a remarkably durable product. Carpet Bonded Foam comes in 6' x 42' x a variety of thicknesses. Generally, for gym use, it is 1 3/8" or 2" thick. A 3/4" thickness is also available. It is used often in rhythmic gymnastics and for a safe covering of exposed concrete throughout the gym. These come in a variety of colors -- all at the same price. To avoid surprises, make sure that velcro is included in your pricing. Strong Needle-Punch Carpet - This is the strongest carpet used anywhere in the industry, yet it is soft, with the touch of velour. The polyolefin fibers are not stringy and cannot be pulled out by velcro, a problem common to less expensive and lighter weight carpets. Similar products may look identical, but lighter weight 10–14 oz. carpets simply do not provide the quality, durability and performance of our tough 26 oz carpet. The carpet makes the floor. Rollable Floors are generally cross-linked polyethylene foam. There are several types of this foam. The most highly sought for sports a trocellen sport foam. This is a sport performance foam renowned for the fact that it will absolutely not harden over time, while maintaining maximum shock absorption and resiliency. This is what we offer at The American Gym. Introduced in 1972, this foam provides the fast response required in Cheer, Gymnastics and Martial Arts. It's proven to substantially outlast non cross-linked foam as its cell structure will not break down under repeated bending or compression. Other polyethylene foams may look and feel like ours, but without its unique chemical composition, they are unable to provide the shock absorption and resiliency that ours offers. This foam will not support growth of fungi or mold and does not emit dust or fibre products. It is a simple product to put down and take up. It can be done in minutes. To put down, you simply unroll the unit. The velcro that keeps it together in a roll is used to join the segments. Velcro grips the carpet surface itself. To take up, just remove the velcro, flip the foam, and roll it with the carpet to the outside. (Flipping the rolls over is not necessary with Flexi-Rolls.) Roll out the velcro strip to secure the foam until next time. Prices shown below do not include freight. Warranty covers carpet/foam bonding and carpet wear only when used as intended for cheerleading, gymnastics or aerobic activities. This is the longest warranty in the industry. Note: The 3/4" is not intended for tumbling. The minimum thickness recommended for tumbling is 1 3/8". The 3/4" is great for aerobics activities, rhythmic gymnastics and for safely covering exposed areas of the gym. Need just just one roll? As stated above, when you purchase your rolls, the essential velcro that you need to connect the rolls you buy, are $10 each. 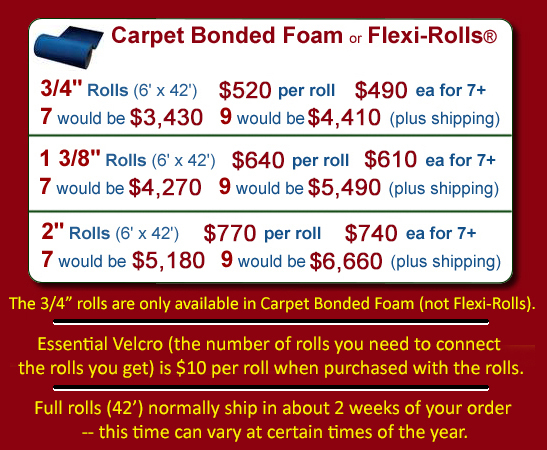 So, if you were to buy 7 rolls of Carpet Bonded Foam or Flexi-Rolls, you would need 6 rolls of velcro. Any additional of velcro rolls beyond this that you would like are priced at $30 per roll. 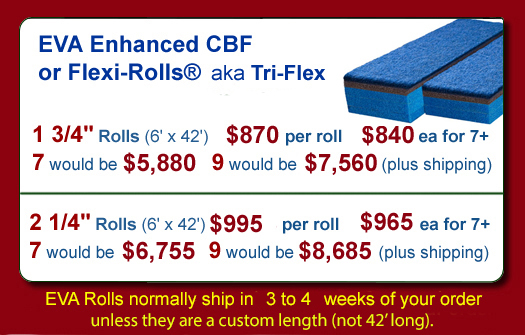 About roll length -- Carpet Bonded Foam (and Flexi-Rolls) regardless of the manufacturer, will not arrive in an exact 42' length. This is impossible for the manufacturer to accomplish because of the nature of the product. They will be something more than 42' -- usually 2" to 5" over. The rolls should be laid out flat and allowed to acclimate for 24 to 48 hours before assessing whether they need to be cut or not. They may be hot or cold after shipping and therefore longer or shorter than they will ultimately be in your facility -- even altitude has an effect. Cutting is not difficult, but as the saying goes 'measure twice, cut once'. The quickest and easiest mat ever made! 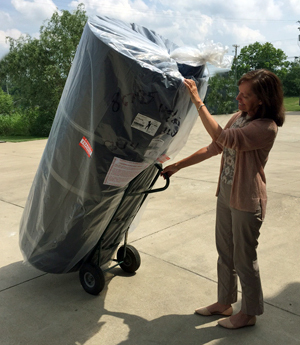 One person can set-up or break down a 42’ X 42’ Dollamur Flexi-Roll® floor in just minutes. Even a preschooler can unroll a section! You'll get the same great performance of our regular rollable mats chosen for years by top gymnastics and cheerleading programs. The same high performance sports foam, the same durable carpet and the same state-of-the-art bonding method. The best just got better! Rolling out and rolling up can be easily accomplished by kids due to the foam backing being slit (every 4"). The 1 3/8" thick rolls form into a nice round roll, the 2" makes more of an oval roll. These rolls also tend to lay flatter more consistently at the ends than the Carpet Bonded Foam. Prices shown below do not include freight. All roll colors are the same price. Rolls are normally shipped in around 2 weeks (unless bought in custom lengths). Three-year Limited Warranty - on carpeted foam laminated products. Warranty covers carpet/foam bonding and carpet wear only when used as intended for cheerleading, gymnastics, martial arts and aerobic activities. Standard Orders (for full 42' rolls) ship in around 2 weeks of approved order. Custom-sized rolls (non-42' length rolls) normally take a week or so longer. One-person setup, No Flipping of Rolls is necessary. Carpet is protected on inside of roll when stored. Rolled mats won't unroll when set on edge. The Tri-Flex® floor is unlike any foam floor surface you have ever used before. Three different foam layers and densities are fused to provide extraordinary speed, rebound and shock absorption. Dollamur’s exclusive cross-linked polyethylene formula combined with EVA foam provides height and airtime that can’t be touched by any other mat on the market. Available in 1 3/4” and 2 1/4” thickness, as well as foam-only rolls. This is the fastest, liveliest and most dynamic rollable floor in the world. Available in the same 8 color choices above. The EVA Enhanced Rolls ship in 3 to 4 weeks of your order - unless when ordered in custom lengths (not 42'). These rolls must ship via motor freight. In the picture at the right, you will see how the rolls will arrive at your facility. (This one is 1 3/8" thick.) One person can easily move these, regardless of thickness, with a two-wheel dolly. Note: The velcro roll is attached to the top of the rolls.